Anti-Junctional Adhesion Molecule 1 Rabbit Monoclonal Antibody | A1596 | BioVision Inc. 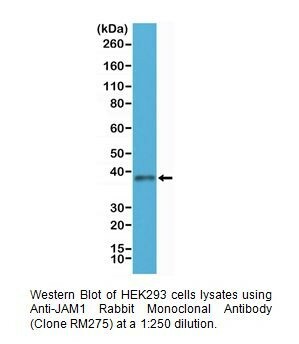 Monoclonal antibody to detect JAM1 in human samples. 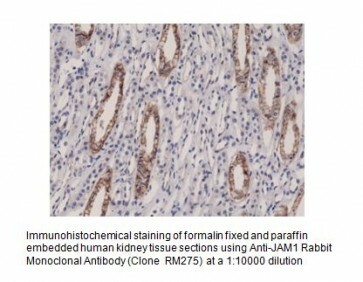 Seems to play a role in epithelial tight junction formation. Appears early in primordial forms of cell junctions and recruits PARD3. The association of the PARD6-PARD3 complex may prevent the interaction of PARD3 with JAM1, thereby preventing tight junction assembly. Plays a role in regulating monocyte transmigration involved in integrity of epithelial barrier. Ligand for integrin alpha-L/beta-2 involved in memory T-cell and neutrophil transmigration. Involved in platelet activation.